The Los Angeles Rams are not doing a whole lot wrong these days and the special teams area is no exception. FirstDown PlayBook has been going through some of the NFL and college highlights from the 2018 football season and this punt block scheme jumped out at us. There was great execution by the LA Rams but there was also some obvious detailed preparation involved to expose the LA Chargers’ protection scheme. The traditional spread punt formation is a rarity these days in college and high school football because of the rule difference that allows the punting team to release down the field before the football is punted. 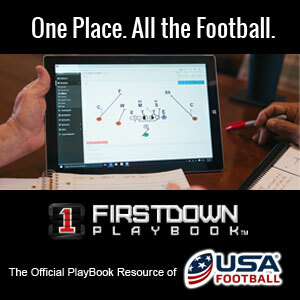 As you know though, FirstDown PlayBook is a full service provider meaning that we draw up plays that we see and plays for our NFL coaches too. Make no mistake about it, as someone who has drawn many a offensive, defensive and special teams plays in the NFL, when we release the new FirstDown PlayBook Draw & Edit tool in January there will be plenty of value for the thirty two teams in that league too, so we want to make sure we keep providing content in that area as well. The other thing to keep in mind as you take a look at this short video, where we keep all of our great Youtube content, is that there are definitely principles that carry over from blocking a shield punt to blocking a spread punt. The main one is that regardless of the style of punt team you are facing, most of the time you want to create an illusion that you are doing something else to distract the protection from your actual objective.